There will forever be people who think they know something more about a movie than the people in the movie. After some fan theories about the final scene in “The Dark Knight Rises” Batman himself is hear to tell you how it really went down. We all know how Bruce Wayne went out in Christopher Nolan’s epic conclusion to his Batman franchise. Batman sacrificed himself for Gotham, the city has was protecting all along. We are left think that Bruce Wayne is gone until Alfred sees him sitting at a cafe, detailed previously in a dream that Alfred talks about. There are some who think that this ending was just a dream, and that Bruce is dead. I have to tell you that I think this theory is completely stupid. 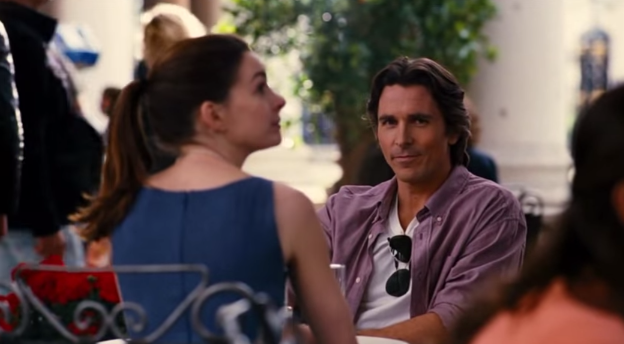 So Christian Bale decided to let us in on how he saw it all go down. [Alfred] was content with me being alive and left because that was the life he always wanted for him. I find it very interesting and with most films, I tend to say, ‘It’s what the audience thinks it is.’ My personal opinion? No, it was not a dream. That was for real and he was just delighted that finally he had freed himself from the privilege, but ultimately the burden, of being Bruce Wayne. Boom. Take that fanboys! Not a dream. We all live happily ever after. Watch the scene for yourself below. Posted on December 12, 2014, in Entertainment, Movies and tagged batman, christian bale, dc comics. Bookmark the permalink. 3 Comments. When I first saw the movie I thought it was going to end with him just looking up and smiling instead of going over to Bruce and Selina. It would have been cool, but I certainly didn’t take it as a dream.